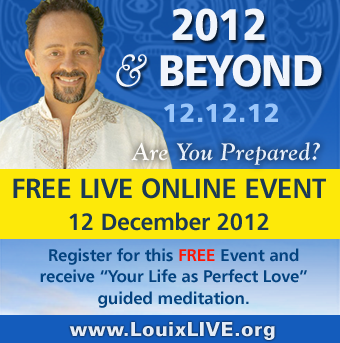 Date & Time: Wednesday, December 12th, 6:00 p.m.
On 12.12.12. join Louix for a FREE live internet event entitled 2012 and Beyond where he will discuss the significance of this time period, what December 21st 2012 actually symbolizes, and how you can make the most of this huge opportunity for growth and expansion. Louix will begin this once in a lifetime free event with a short meditation followed by an enlightening discourse and Q&A. If you miss the live event, a limited-time replay will be made available. Please visit LouixLIVE.org to register and for more information.